Gather your friends and family for game day, y’all – it’s FOOTBALL SEASON! It is one of my favorite seasons of the year so I am thrilled to have partnered with P&G to share a few tips and printables to add some pizzazz to your game day viewing parties. No matter which team you’re cheering for (Go Tennessee Titans! ), I hope you find some football inspiration to root your team to victory. 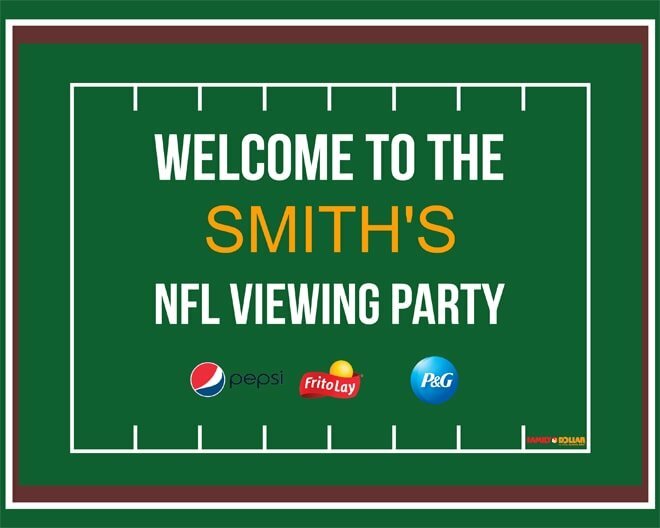 Below are my top tips for football viewing parties followed by some free printables for you to download and enjoy. The team at P&G and Family Dollar shared (above) how they used these printables to get ready for their viewing parties! We can’t wait to see how you use them too! Feel free to tag @pizzazzerie and show us your game day viewing parties in action. Now or some viewing party tips! Now is the time to stock up on your party supplies (check out stores like Family Dollar for a quick, one-stop shop) including the perfect party foods like hot dogs with all the toppings or a nacho chip bar. Setting up foods “DIY” style allows everyone to create their own favorites. Have an assortment of chips like Lays, Doritos or Tostitos handy so your guests can snack the entire time the game is playing. Football games can get exciting, so keep your Bounty handy throughout the viewing area for your guests to grab in case of spills. Be sure to have extra supplies on hand too (like Duracell batteries should the remote stop working). Also, don’t forget about the kiddos! Set up blankets, pillows, pom-poms in the team colors and other football paraphernalia as a kid’s cheer section right in front of the TV. Football games can be long. Keep enthusiasm up by passing around sweet little treats and hand out football-themed word puzzles to keep the kids occupied. Everyone will be fully charged and ready to continue cheering for the second half. With these tips, you’ll be ready to give your friends and family the perfect party atmosphere to cheer your team on to victory! 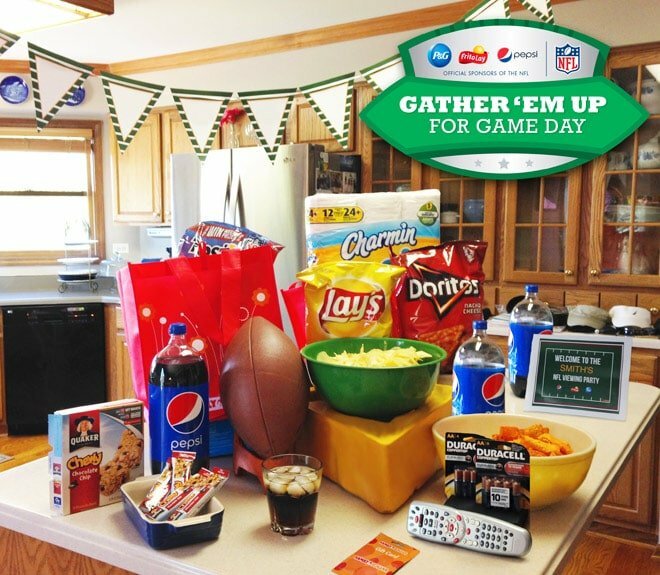 And, by knowing where to shop, you won’t have to break the bank to create a fun game day party. SCORE! Time for the Free Printables! Simply click and save the files above to your computer. Open and edit the welcome sign and print! For the banners, simply open, find your favorite team, and print as many as you need! Go team! Check back right here over the next week as I share links to bloggers across the country who are hosting their own fabulous game day viewing parties with these printables. We hope you’ll be inspired to gather ’em up for game day! THANKS TO…P&G + Family Dollar for sponsoring this post as well as Kori Clark for designing our printables! “Cute as a Button” Themed Baby Shower! Hi Janet! Oh no! I did a little testing with other computers + several other friends tested it for me, all were able to download without trouble. Is your Adobe Reader updated? That can sometimes cause this error. If you still have trouble, email me and I can attach them that way which might help! I will try it again. I realized I needed to update the Adobe Reader so I am hoping that helps :) Thanks Courtney. If I have trouble I will email you. Have a beautiful day!! I love football and also love these banners i can try to download in my computer. DO YOU HAVE THE BLANK ONE?